Just about all visitors to Boston learn about the red line on some of the sidewalks of downtown Boston. This is the painted and bricked marker of Boston’s Freedom Trail. The trail takes visitors on a walking tour of downtown past numerous historical structures, centuries-old cemeteries, churches, and government buildings that were, in one way or another, involved in the American Revolution and early history of the new United States. The trail includes historical meeting houses, homes, and monuments marking locations of key events of American history. 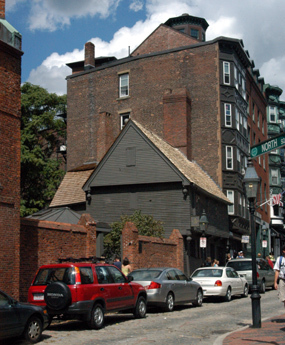 Visitors also have a chance to enjoy modern Boston and all of its diversity. The walk moves through the business district and into the North End’s Italian neighborhood. Visitors find shopping nearby. Restaurants and old watering holes for residents and visitors alike are on every street along the trail.